Dental patients are constantly at battle with bacteria and plaque. Bacteria tries to rear its ugly head and grow every minute of every day. Brushing and flossing are the two best defenses against tooth decay, bad breath, and weakening of the enamel. Unfortunately, most people rush through their days and do not take the time to fortify their mouths with proper teeth oral hygiene. Implementing a steady and reliable program today can prevent patients from having multiple teeth problems in the future. Parents should start their children on a healthy brushing and flossing schedule while they are young so that they do not suffer once they get their adult teeth. Tooth brushing is the first line of defense against developing an oral cavity. Therefore, developing an effective routine is necessary. The first teeth brushing tip is to brush for a least two minutes. Brushing the teeth for less than two minutes is counterproductive because it does not give the toothpaste ingredients enough time to penetrate the teeth’s enamel. Brushing should be thorough, and the person should do it for a full two minutes. 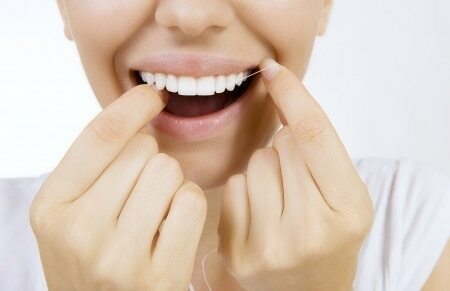 Many patients are unclear as to the best teeth flossing method. A person who flosses once per day is well on his or her way to dental health. However, flossing twice per day is recommended. A person should floss once in the morning to clear out anything that may be in between the teeth from the previous night and a second time right before bed to remove any particles that accumulated inside the mouth during the day. A patient can floss a additional times during the day if desired. Patients can do other things to lessen the orthodontist’s load in-between their regularly scheduled visits. One thing that they can do is ensure that they drink enough water. Eight glasses of water per day are the recommended dosage. Adding milk to the menu will strengthen the bones and the teeth because of the calcium. Furthermore, a person can chew gum that contains cinnamon during the day. Chewing gum does have some positive aspects. It increases the amount of saliva in the mouth, and it helps to purify the teeth’s outer shell. Patients will still have to visit specialists even when they implement the best teeth care practices. The orthodontist is someone that they may still need to see even if they have no cavities or disease. Papandreas Orthodontics is a group of skilled specialists in which everyone can rely. The office has a wide variety of solutions for struggling patients who have alignment problems. Invisalign and Incognito are two alternative systems for traditional braces. The first step is conducting the tasks that keep teeth healthy. Interested people can schedule an appointment for a free exam by calling (440) 582-8585 today.